July 27th, 2012-Lord Nawab Lt. 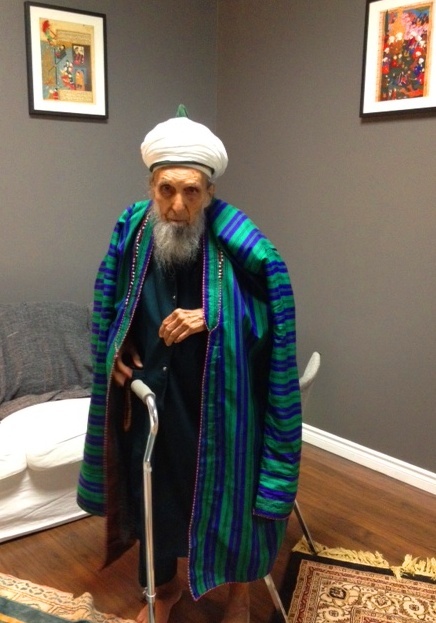 Colonel Sayyid Mohammed Amiruddin, who will mashallah be turning ninety-nine this year according to the Hijri calender, at the ASFC Spiritual Wellness Centre. This picture was taken after the nightly Tarawih prayer and weekly Khatm al-Khwajagan Dhikr. The authors of Fatawa i-Rahimiyya wrote, “The famed preacher from Hyderabad (Deccan), Colonel Amiruddin, at whose hands nearly three thousand Americans have accepted Islam…” (“Note to Revised Edition”, Fatawa-e-Rahimiyah Vol.1, Lajpuri, 1975). In 1967, the Nawab was permitted to enter the lower inner sanctum behind the auspicious golden gate and visit the tomb of the Prophet (sallallahu alaihi wa aalihi wa sallam), where he says, he heard the Prophet (sallallahu alaihi wa aalihi wa sallam) reply to his salam, which caused him to fall unconscious. He visited the tomb of Ghawth al-Adham Shaykh Abd al-Qadir al-Jilani while in Baghdad, Iraq, and was specifically instrumental in bringing Shaykh Abdul Fattah Abu Ghuddah back to Hyderabad, India. He was originally initiated into the Naqshbandi tariqat by the Muhaddith of Deccan Syed Abdullah Shah Naqshbandi, and in 2005, was secretly re-initiated through Mawlana Shaykh Nazim, as documented in his audio statement. Is it possible that the audio statement of Hazrat Colonel sahib could be made public if it has not been already? I would very much like to hear what he has said. May Allah give him longer life. Sorry brother, he has specified it not be released until there is permission. Perhaps there is fear certain sects might oppose him, and create stress for this senior. In the clip, he speaks of his Naqshbandi history, and regarding his renewing of baiah to the order. He also speaks of a dream he had with Hadrat Mahdi (alaihis alam). This entry was posted on August 7, 2012 by ASFC in Uncategorized and tagged Ahlus Sunnah Foundation of Canada, ASFC Spiritual Wellness Centre, Facebook, naqshbandi, Sayyid Ahmed Amiruddin, shaykh nazim, Sufism.